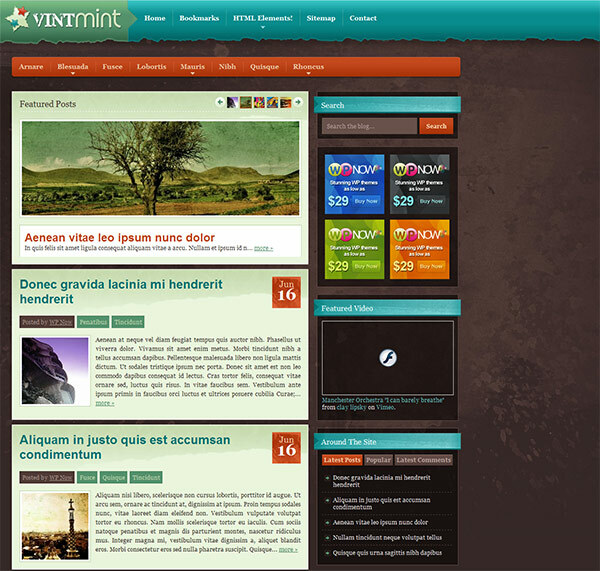 Vintmint has a cool vintage feel to the design, with features and coding that is as modern and cutting edge as it gets. An elegantly grungy design that will transform your personal or portfolio wordpress blog into a work of art. The VintMint premium wordpress theme is WP 3.0 ready, it supports 3.0’s Custom Menus, and comes with Intuitive Theme Options Panel as well as with Easy-to-Use Built-In Ad Locations. You also get a Unique Homepage Content Slider, Widget and Adsense Ready, there is a WP Now’s “Around the Site” Tabbed Widget, Menu & Submenu ‘Show’/’Don’t Show’ Customization. This is a “No Sidebars” Template, with “Links & Bookmark” Template and “Sitemap” functionality, Threaded Comments, Multi-Level Dropdown Menus as well as Stylish Blockquotes & Nested Blockquotes and Custom Widgets: Flickr, Latest Comments, RSS Subscribe.